Whew! We’ve completed a month in this year of lightening up! I didn’t anticipate how quickly it would lead me to poking about in the sub-basement of my psyche. But enough about me, let’s shed something! The fountain pens struggled to deliver while I was writing my “morning pages” today. I shed a bottle of fountain pen ink on 7 January but spared a couple others in that purge, hoping to squeeze a few more fillings out of them. The “Claret” consistently clogs, however, and the “Regal” does little better. Should they stay or should they go? 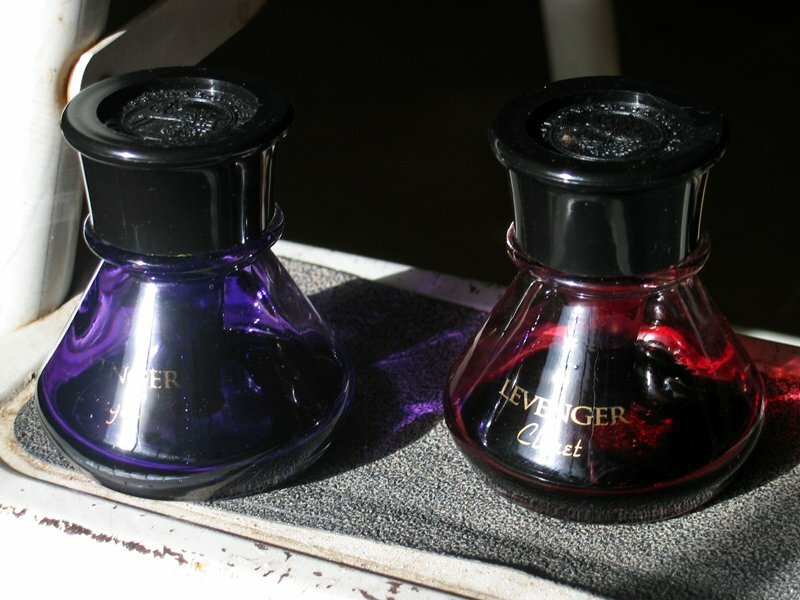 I wrote hundreds of pages with the inks from these bottles, but no more. I value economy. I paid for all of it, so I want to receive its full value. Systems, once established and stable, seek to maintain the status quo, and I’m a system. Replacing what half-works will take time, money, and trouble; at the moment the cost of twiddling with it a little longer appears lower—whether it is or not. I spar constantly with perfectionism and sometimes accept “good enough” just to spite it. There’s always one good reason to keep using a thing past the point of convenience: avoiding waste. I want to participate as little as possible in behaviors which, writ large, are changing earth’s climate and killing eco-systems world-wide. Don’t shed blithely—I declare that another rule of shedding. The glass bottles went in the recycling bin. The plastic parts had to go in the garbage can. Comments welcome … what might you shed today? I felt ambivalent claiming this as my daily shed, because nothing left the house. Though I’m glad to dismiss non-tangible mental and spiritual clutter like advertising e-mails and negative attitudes, the rules of the game seem to say: if it’s a material object getting shed, it’s got to go away. Or at least get queued up for departure. But Nimue reminded me that William Morris enjoined, “Have nothing in your houses that you do not know to be useful or believe to be beautiful.” “It wasn’t useful, and now it is,” she said. “Isn’t that a weight lifted?” As so often, she’s right. 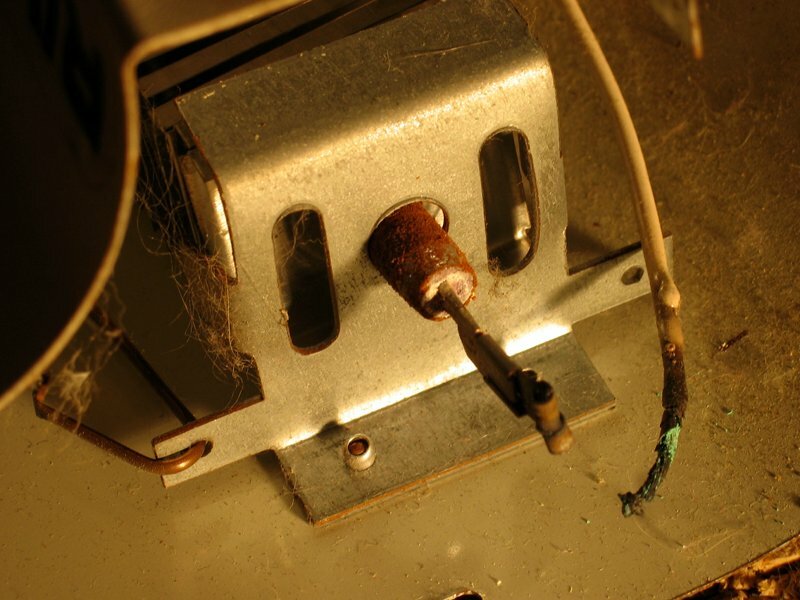 The heater stopped working years ago with a flash and curl of smoke. I planned to take it apart so I could at least recycle the steel housing, but realized all it needed was a connection cleaned up and restored. 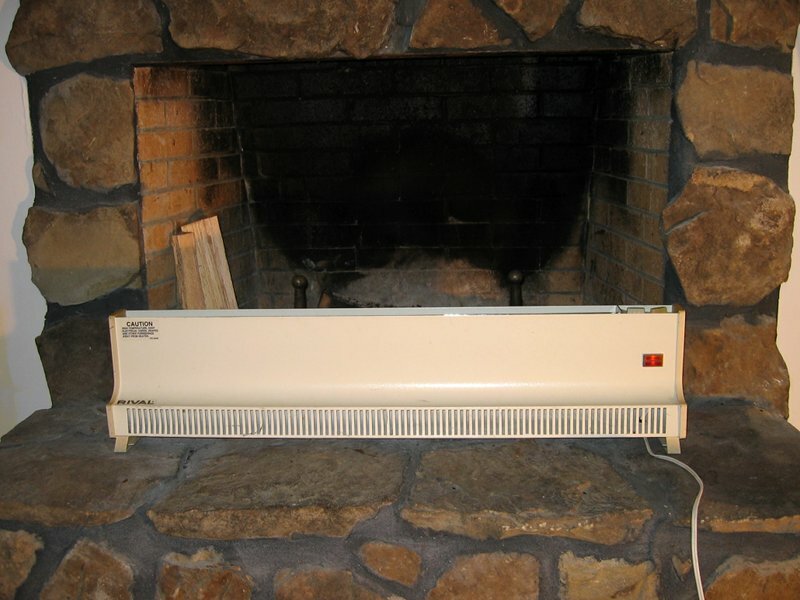 I’ll never call it beautiful, but the heater will comfort us while remodeling the sitting room if the polar vortex shoves another frigid lump of arctic air into the southeastern US. Some day in this year of lightening up I’ll post that I’ve shed Werner von Braun. That will be a great weight gone (about 3100 lbs. or 1406 kg., if we’re counting). Anticipating it already sends sesmic shock waves through my spirit. I’ll feel tremendous relief. And also an avalanche of grief, equally mixed with shame. But I’m at least thinking about trying to get ready to shed him. Okay, I see that I mired that intention in levels of qualification, but I’ve announced it … that’s something. Here’s something more, a single step, a simple step. 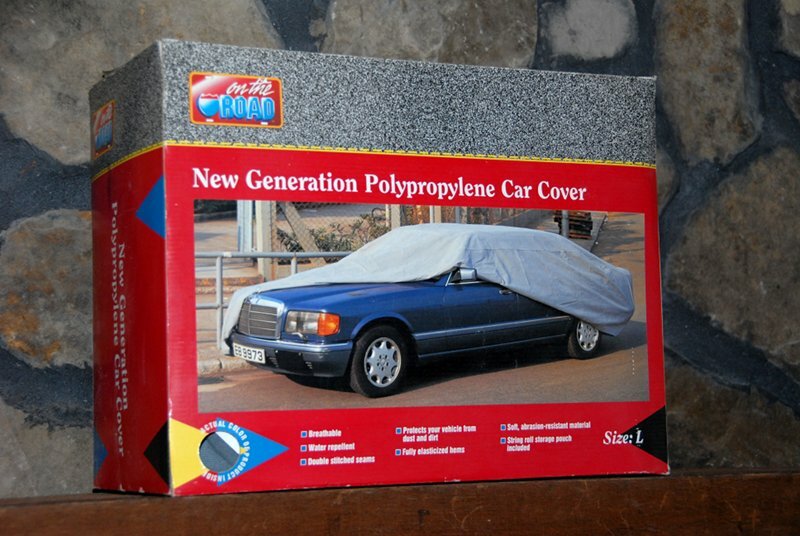 On craigslist I’ve offered up Werner’s car cover, still new in its box, never worn. Ouch. That hurts so good. Today I make another start at letting go of who I used to be that I no longer am. Nimue and I met and married while in graduate school in Chicago. We were, consequently, grad-student-poor, a state my memory has gilded with affection. Poverty’s no fun for graduate students today, who receive less support and often acquire terrible debts along with their training. We just had to solve how to furnish our walk-up (Chicago vernacular for a low-rise apartment with stairs … ours was on top on the fourth floor). We had one big, well-lit room with glorious hardwood floors we ate, slept and studied in; a tiny kitchen; and a minuscule bathroom. At a church rummage sale we got an old schoolhouse desk, chest of drawers, and chair that needed re-caning (it still does, sigh). Nimue’s parents gave us an Art Deco apartment dining table and four chairs they found in a secondhand store. I built bookshelves. Vegetable crates held LP records. But we had nothing for toiletries in the bathroom except the windowsill. It was covered with a security grate, through which we reached to get our toothbrushes. 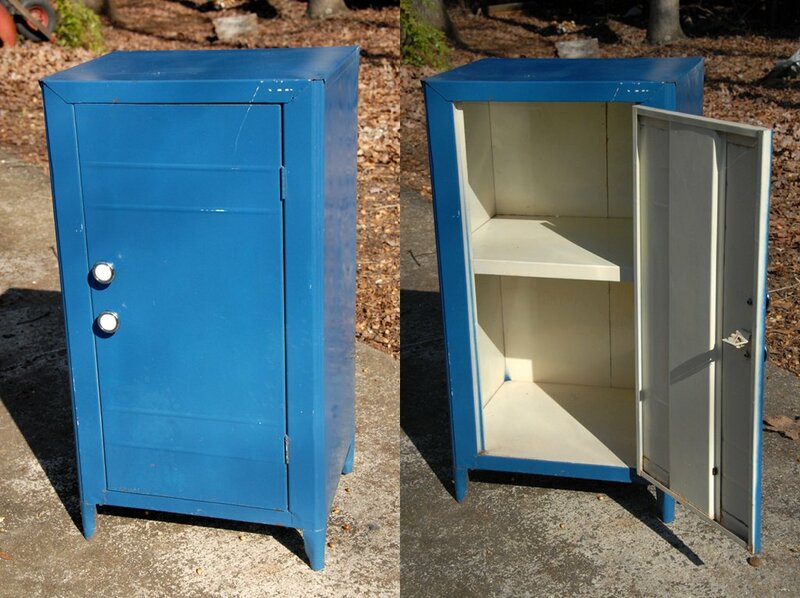 From an alley, set out by garbage cans (the universal sign that an unwanted-but-still-usable item was for the taking), I rejoiced to scrounge a cabinet. It was die-formed steel, finished in the usual off-white enamel, with two shelves (hers and his!) and a door that miraculously wasn’t bent. I sanded off the rust, shot it with rattle-can spraypaint in Nimue’s favorite color, and put it under the sink. It was perfect for the year we lived there. Then we moved downstate, and the cabinet moved with us. But it didn’t have a job to do in the new house. I shrugged and put it in a corner of the mudroom. I think I eventually stored some screws and nails in it. When next we moved, the cabinet sat empty in the basement—as it’s remained through each subsequent move. Today, I removed it from neglect in the garage. I wiped cobwebs off, took its picture, and posted it to craigslist. Thirty minutes later a mother sent an e-mail: “So this would be perfect for my daughter’s bathroom, to hold her hairbows and such.” Ah, I smiled, recognizing a part of the universe finding its place. It’s made me ridiculously happy. It’s normal business hours in the continental US now, so I phoned the number AT&T provides to request to be added to the Do Not Mail list (800-288-2020, should a reader likewise want it). After getting a rather warped version of the AT&T jingle, I furthered my acquaintance with the voice-recognition robot. He needed a couple minutes of patient replies to his questions to hit the end of his flow chart and figure he should refer me to someone with a bigger vocabulary and greater powers of fuzzy logic and pattern-matching (that is, a customer service representative). I didn’t have to endure much elevator music till one came on the line. She accepted my request and said she’d forward it to those who maintain the DNM list. She had a script, too, it appears. At the end, sounding a little embarrassed, she said, “AT&T reminds its customers to please not text and drive. Have a good day.” I laughed and wished her the same. It’s sane advice. I’m pleased with the interaction. Of course I’ll be watching in about a month for the flow of AT&T U-verse junk mail to stop. But I’ll stake this shed some hope and call it a success. Today I took aim at stopping AT&T’s flood of direct mail marketing, which seeks to sell us entertainment services we don’t need, don’t want and don’t choose to imagine we should afford. I knew it might be hard to achieve since AT&T became our internet service provider when it swallowed BellSouth. They might claim that, since they have a business relationship with us, we’re fair game. The original caption for this screenshot read “a page from the devil’s bible.” Whoops, it still does. The arrogance chills me. 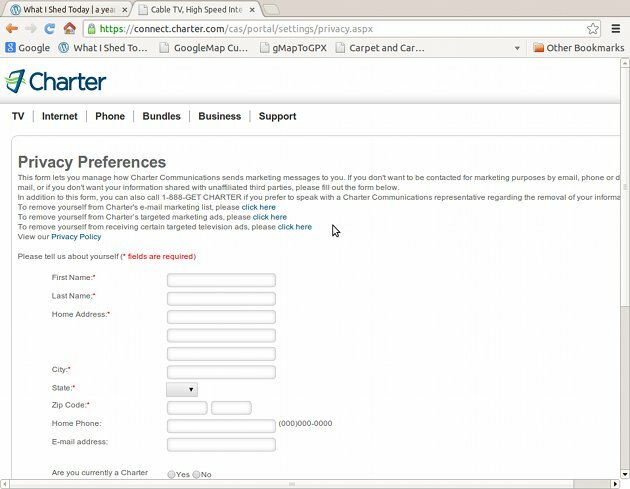 Charter Communications had an easy online form to complete. I have to phone AT&T. Our request will expire in three years. 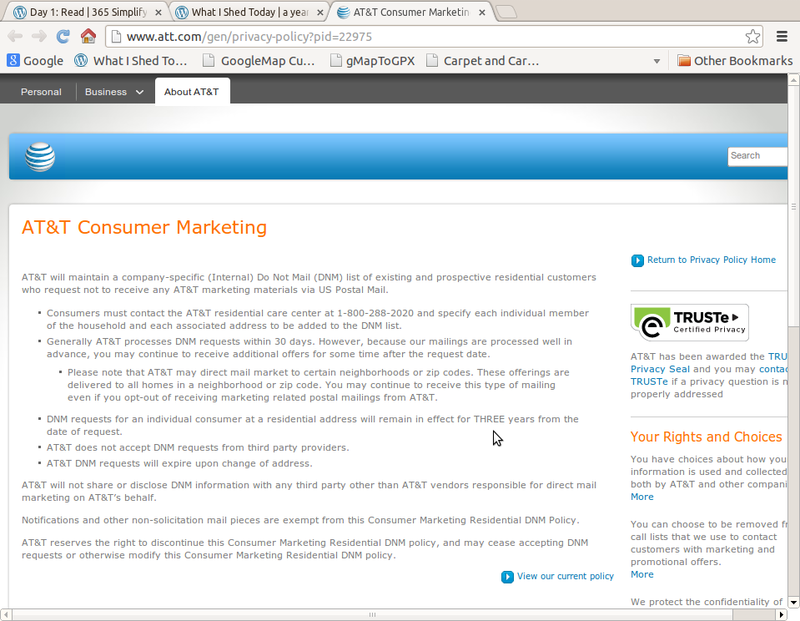 AT&T won’t accept “Do Not Mail” requests from third parties … read: from the Direct Marketing Association. (AT&T evidently is too big to play by industry rules.) And oh, they may decide to abrogate all this at any time. Well, let’s live-blog how this goes, shall we? Thanks, Charter, and goodbye! Please don’t take it personally. AT&T U-verse junk mail is next to shed. “Nine pounds of raw exuberance” defines Blueberry, who never comes into a room, but arrives. Once present, she loves to underscore it by making a racket. Pawing the slats of lowered mini-blinds does it very well! 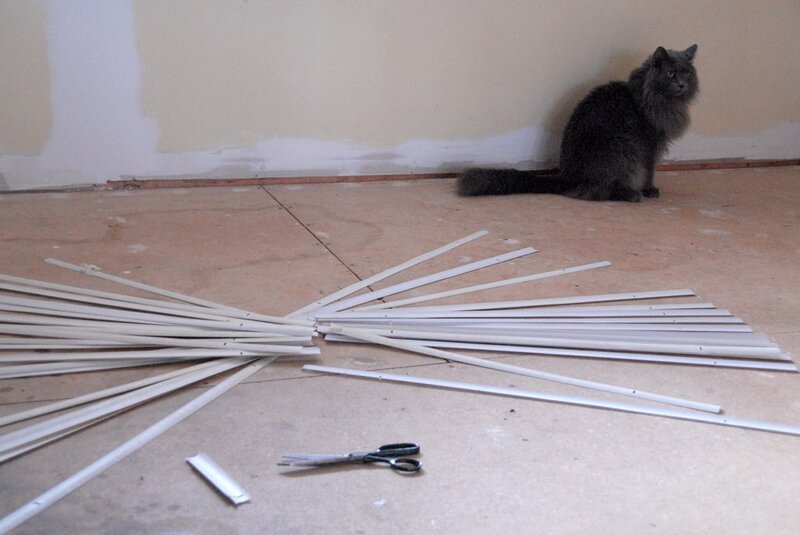 She means no harm, but if a claw hooks and cuts the “string ladder” so half the ensemble cascades toward the gravitational center of the earth, well … what’s a cat to do but look obliviously cute? And what are her humans to do but sigh and try to re-purpose the pieces? 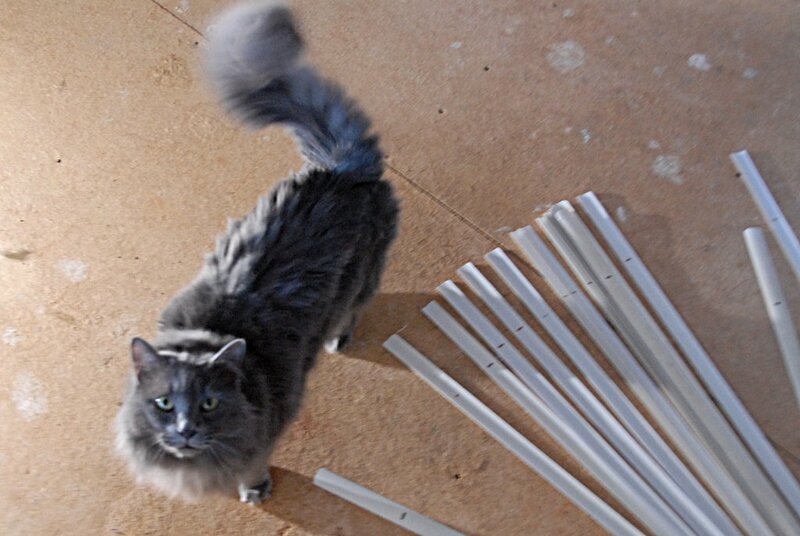 So Nimue asked Mr. Google: “recycle mini-blinds?” And found a gardener’s tip: cut the slats into row markers. Yeah! So now we have a lifetime supply, plus enough for three or four rounds on the wheel of rebirth. At our next few community garden network monthly meetings, I’ll share the abundance.